When I was in college, I was required to take a documentary filmmaking class in order to get my mass communication degree. Over the course of the semester I was to make a 12-minute documentary, but there were a few smaller assignments along the way, plus the assignments for all my other classes. During this time I convinced myself that as part of my documentary class, I should watch a lot of documentaries. I would learn what I liked and what I didn’t like, and it would ultimately help me make a better documentary by the end of the semester. And I wasn’t entirely wrong. But I wasn’t entirely right either. Because the truth was I really just wanted an excuse to lay in bed and watch Netflix rather than doing actual homework. If I watched documentaries, I could lie to myself and say it was productive. If I watched Bob’s Burgers, maybe not so much. It’s a problem that still persists today and sometimes I have to ask myself, out of all the creative/educational tasks I’ve assigned myself, which ones are really the amazing feats of intellect that will help me realize my dreams, and which ones are just the tasks I assign myself to distract me from the tasks I’m scared to attempt. For example, I want to write a feature-length screenplay. I’ve already written one that I’m not particularly proud of and I think my portfolio needs a better one. The most productive thing would probably be to just write the damn movie. But what about that copy of Save the Cat I bought but haven’t read yet? I mean surely I should read that book before I write my movie because it’s like the book all screenwriters are supposed to read and surely the movie I write will be better off for it, right? What about these blog posts? Is critiquing movies and tv really helping me learn how to make my own scripts better? Or are they just a distraction from actual screenwriting? I’m asking because a lot of times, I genuinely don’t know. I think there are a lot of things you can do besides writing that help your writing. That includes reading books about writing, talking about writing, and analyzing other people’s writing. But I also think sometimes as writers, the last thing we want to do is bite the bullet and actually write. So we convince ourselves that as a prerequisite, we have to read books about writing, talk about writing, and analyze other people’s writing. We all know that procrastination is dangerous, but I think we especially need to be aware of the procrastination that disguises itself as productivity. We all, myself included, need to take on the projects that scare us; the projects that may very well end up as failures. We need to stop stressing over whether or not we’re prepared for them. That’s one of the most productive things we can do. I’ve spent the past week binging my favorite Netflix Original, Bojack Horseman. 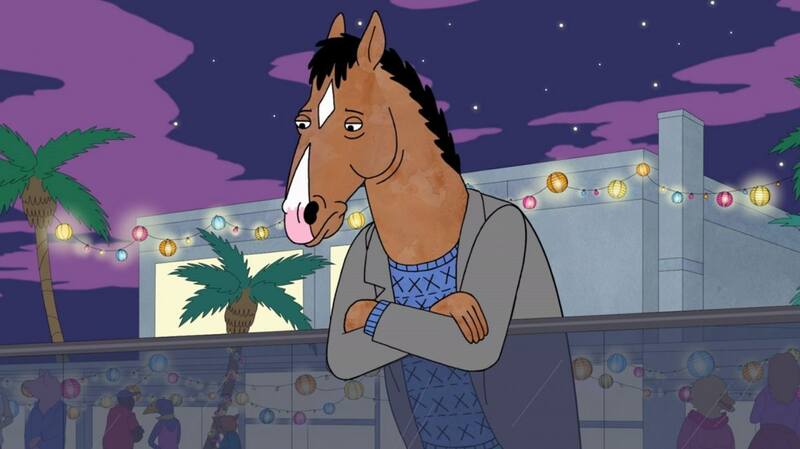 Yes, Stranger Things, House of Cards, and Orange is the New Black, pale in comparison to the amazingness that is Bojack Horseman (insert something about how they’re totally different genres that shouldn’t really be compared here). So I’ve mentioned this surprisingly often for a blog that’s only been around for six weeks, but I don’t really like horror movies. But it just so happens that one of my best friends does, and one of the many reasons I appreciate her is that she drags me out of my cinematic comfort zone. We all need a friend like that. So thanks to her, I saw It, which is about a demon sewer clown that scares children except maybe it’s not a literal clown but just a demon that represents all fears? I’m not really sure. As much as I like to play the role of movie buff in a room full of non-movie buffs, it only takes me about five minutes in a room full of actual movie buffs to remember that I haven’t seen a crapton of the movies that movie buffs enjoy talking about. So while I’d like to pretend that this new series is some sort of attempt to entertain my readers, it’s more just me trying to pressure myself to sit down and actually watch some of those. And I mean watch them properly: no commercials, swear words intact, staying off my phone, with all the lights out. And so that’s how I watched The Sixth Sense, which marks the inaugural movie in this series. I even put my phone on airplane mode for about half of it, that’s how dedicated I was. The Sixth Sense is so well-regarded that Hollywood is still letting M. Night Shamaylan make movies 18 years later even though pretty much none of his work since has lived up to it and some of it is widely regarded to be epic failures.